I am extremely lucky in the fact that, because of my and my wife’s jobs, our situation and our hobbies, we get to travel a bit. 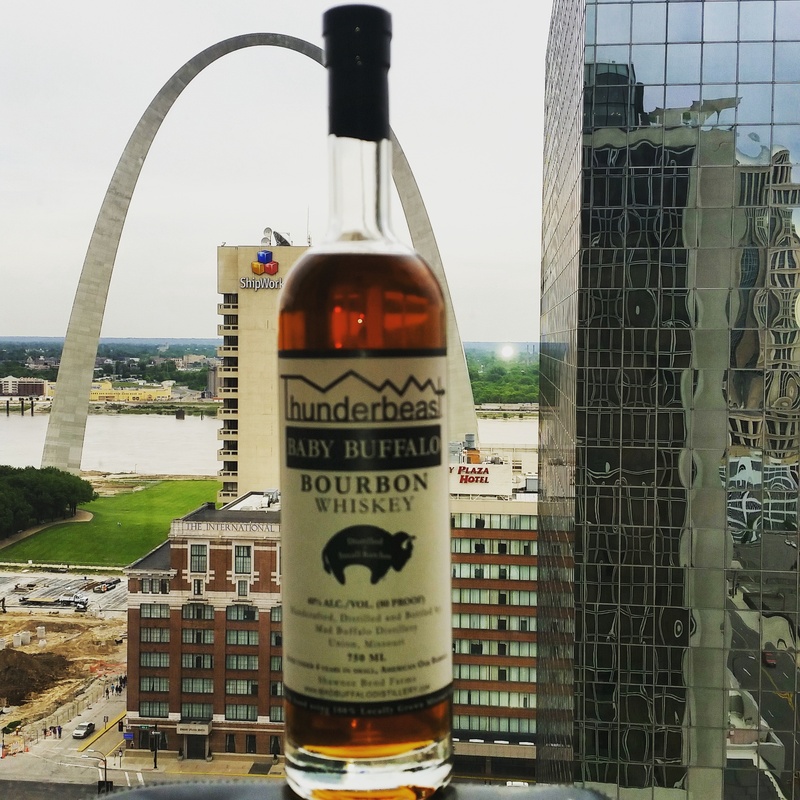 And aside from all of the usual joys of traveling – new places, sightseeing, and different foods, among others – we get to try regionally specific bourbons. Trying something specific to a particular area is one of the things we enjoy the most, and with the explosion of regional distilleries in the past few years, the new things to try are more plentiful than ever. I’ve focused on Michigan bourbons, Vermont bourbons, New York, Massachusetts, Colorado, among others. Today, I turn my sights to Missouri. I went to college there, long before the whiskey renaissance was in swing, and returned recently for a good friends nuptials (more on the drink we shared at a later time). I was pleased to see how many new and locally crafted whiskies there were (as opposed to sourced/bottled/labeled). With that in mind, I picked up a bottle of something I had never seen before, and took it home with me to try: Mad Buffalo Thunderbeast Baby Buffalo Bourbon. First thing first – Mad Buffalo distillery has renamed itself since creating the bottle I purchased, going by Coulter & Payne Farm Distillery. A little bit of research explains why – this is truly a family endevour, and the names are representative of the family lines that both moonshined in Appalachia and farmed in Missouri. The family decided to make the Union, Missouri farm into a distillery in 2011. Right from the get-go, they created a “ground to glass” model, the ultimate in sustainability. They use only non GMO grains, and plant, grow and harvest all of the ingredient crops right there on the farm, before distilling them and even barreling them in wood made from trees growing on the farm as well. This is the ultimate in artisan craft, and is respectable in every way. Currently they are making a variety of whiskies under the Coulter & Payne name, as well as a vodka and moonshine under the “Crop Circle” moniker. So how is the juice? Right off the bat, there is obviously something different about this bourbon. At 80 proof and an age statement of “under 4 years,” it has a youth and lightness in the nose – strong corn, a touch of caramel and vanilla and a little maple. But there is something else, something…floral. Almost perfume-y. There is an air of fresh mowed grass, and flowers, something distinctively earthy. It certainly confused me for several minutes and gave me pause. The taste did not clarify things. Again, the corn was in front, with a soft sweetness expected in such a young drink. There was a soft caramel, a secondary note, and the mouth feel was not particularly thick, and more watery. As it spread out along the taste buds, however, there was a strange sort of bitterness to it that brought to mind certain kinds of bitter greens like spinach. It was earth, and my wife and I struggled to put our finger on it – dandelion? kale? Was it just the difference of not being cut with that limestone Kentucky water? The finish was short, but a slight bitterness remained. I couldn’t get past it. When I added ice chips, the caramel and vanilla disappeared all together and the corn and bitter was all that remained, with a touch of spiciness around the corners. This taste was so distracting that I even checked my glass to make sure I didn’t have a little soap residue from the last washing. I was bummed. I love everything about what they are doing, from an artisan and environmental standpoint. But with the bitterness, I am afraid this bottle is destined for the Manhattan/Sidecar collection. Looking at the website, it looks as though the bottle I purchased was from 2014 or even 2013. Since then, in addition to the name change, they have introduced a host of new products including a Single Barrel and a Cask Strength. It is the cask strength I would most like to try, to see if the bitterness came from the water or was even limited to this particular bottling. I strongly encourage them to keep making whiskey in these new, great ways, and I do sincerely hope to try it again with better results.